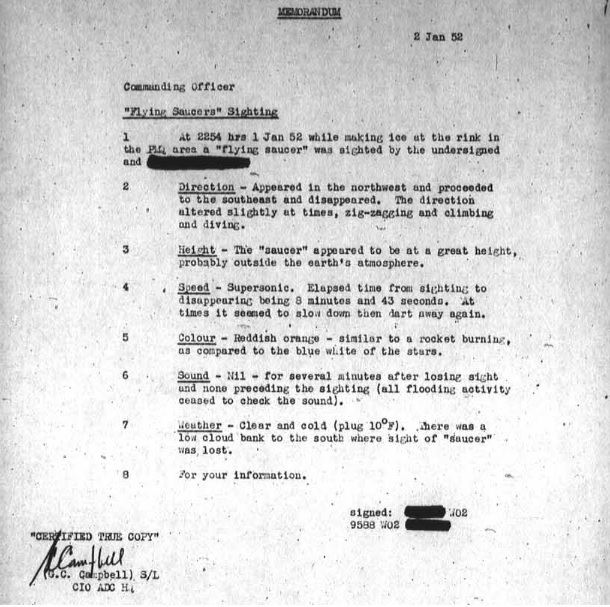 With the airing of the new Project Blue Book TV series, Canadians should be reassured that their own country is well-represented in the original USAF Project Blue Book case files. The actual number of UFO reports in BB files has generally been thought to be about 12,000, but examination of the BB microfilm records by ardent ufologists pegs the number somewhat higher, as much as 15,000 cases. Similarly, the number of cases BB personnel listed as "Unknown" is also a matter of debate. The number of BB Unknowns has often been cited as 701, a number which has practically become a meme within ufology. Researchers who have gone through the case files have noted missing cases, misnumbered files, and even cases that were explained but with unlikely explanations. 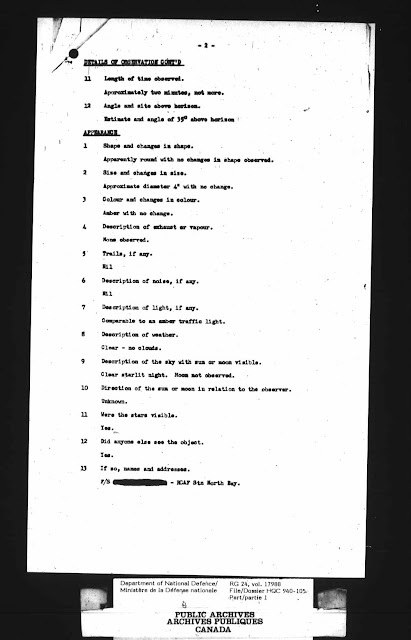 Similarly, others have gone through the files and found explanations for some cases originally labeled Unknown. Despite all this, the number of BB Unknowns is thought to be somewhere between 500 and 1,500. In fact, ufologist Brad Sparks produced a detailed list with even more: 1,738 Unknowns. That's still pretty interesting, actually. If we use the upper values of total cases and Unknowns, that means about 10% were Unknowns. Using the lower values, we get about 4% Unknowns. 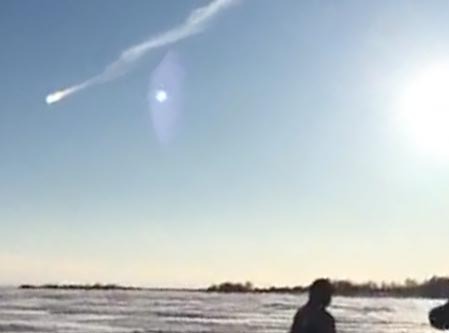 This agrees well with the Canadian UFO Survey, which usually finds the number of current Unknowns to be under 10%, and most often half of that or less. Of the 1,738 cases in Sparks' Unknowns, 44 are from Canada, or about 2.5% of cases considered Unknown by BB personnel. What are these Canadian cases? 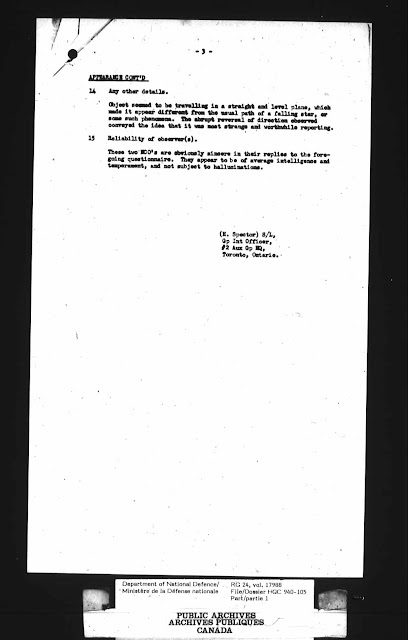 As an example, on April 12, 1952, at 9:30 pm at CFB North Bay, Ontario, Warrant Officer E. H. Rossell and Flight Sergeant Reg McRae both saw a bright amber coloured disc moving through the sky. The saucer-shaped object came from the southwest and moved across the base airfield, stopped, then reversed its direction of travel. It climbed at high speed and disappeared from sight. In the Blue Book files index, the case is #1108. Curiously, a similar observation at North Bay is in the National Archives. but not listed in the Blue Book index. "...malfunction of equipment is not considered as an exact cause..."
Dozens of other Canadian cases, mostly in Labrador and Newfoundland, are part of the Blue Book files. Sept. 17, 1951. Hudson Strait (at 61°30' N, 68°50' W) to Baffin Island, Canada. 10:20-11:55 p.m. (EST). USAF B36 radar operator Major Paul E. Gerhart and navigator Major Charles J. Cheever on a flight from Goose Bay, Labrador, to Resolute, North West Territories, heading NW at 208 knots (239 mph) over Hudson Strait, picked up radar interference which came from an unidentified aircraft at relative bearing 130° (E) at 28 n.mi. (32 miles) heading away. Anti-jamming device on the APQ-24 radar was turned on at 11:20 p.m. but did not affect the jamming on the radar scope. At 11:35 jamming covered 120° of the right side of the radar scope and then an unidentified aircraft was seen visually on the right side of the B-36, which was then at 18,000 ft at 65°40' N, 71°40' W (over SW Baffin Island). Object had "unconventional running lights" all white instead of red-green, with twin white flashing tail lights, traveling about 30 knots faster than the B-36, crossed the front from right to left heading 334° true towards the NNW, and was in view about 20 mins [to a distance of about 12 miles]. While the object was still visible, at 11:50 p.m. the B-36 autopilot and APQ-24 radar set went out, the latter returning after a few mins about when the object disappeared. ECM operators S/Sgt. 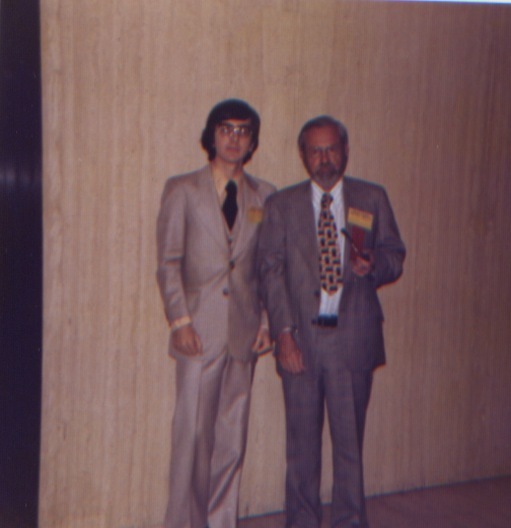 Donald E. Jenkins and S/Sgt. Doty T. Larimore on 2 B-36 flights from Goose to Resolute while still over Labrador the next day detected carrier wave signals at several frequencies and some radar-like pulses at other frequencies, all below 1,000 MHz. And then there was Head Start II. Most people are unaware that in the late 1950s, the United States was testing an airborne defence system whereby fully armed nuclear bombs were flown aboard B-52s across North America. Called Head Start, it was in three phases, and during at least one of the missions, something strange happened that could have been deadly. And it occurred over Swift Current, Saskatchewan, on March 25, 1959. At 7:36 p.m. (MST), a B-52 with the call sign “Outcome 15,” from 92nd Bomb Wing, Fairchild AFB, Washington, was on SAC Emergency War Order exercise, Operation HEAD START II, for continuous airborne alert carrying fully-armed thermonuclear bombs, and had initially flown into Canada. At about 52°N, 118°W (near Swift Current, Sask.) while headed 180° Mag (SSW True) at 32,000 ft traveling 375 knots (432 mph), tail gunner Tech Sgt Joe Cobb sighted an object leaving a strange, non-persistent and intermittent contrail at his 2 o’clock position (to the W) and headed N. At 7:41 p.m., Cobb detected a target trailing the B-52 at 8,000 yds (about 5 miles) range on his MB-9 airborne radar. Electronic Warfare Officer 1st Lt. Robert J. Millard detected on the APS-54 Radar Warning Receiver an X-band radar emission at 9135 MHz from an unidentified object tailing the B-52, then also detected the same signal on his APR-9 ELINT Radar Receiver for 20 mins; sweep rate 1 per second, radio frequency oscillating around 9135 MHz. Shortly after, the B-52 radar officer Capt. Feirran detected a UFO on MB-9 airborne radar showing it trailing behind at a range of about 11,000 to 15,000 yds (about 6-8 miles). B-52 pilot Capt John W. Jackson radioed 1/Lt Ronald S. Murray, Senior Director on duty, ADC GCI radar site (47°31’N, 111°10’W) 801st AC&W Sq, Malmstrom AFB, Great Falls, Mont., that a UFO had entered its Air Defense Identification Zone by following B-52 into U.S. territory and ADC then scrambled a F-89J fighter interceptor, call sign "Board Pipe 27," pilot 1st/Lt. Austin E. Bond, with Radar Observer 1st/Lt. Charles C. Abernathy, 29th FIS Sq, Malmstrom AFB, Mont. 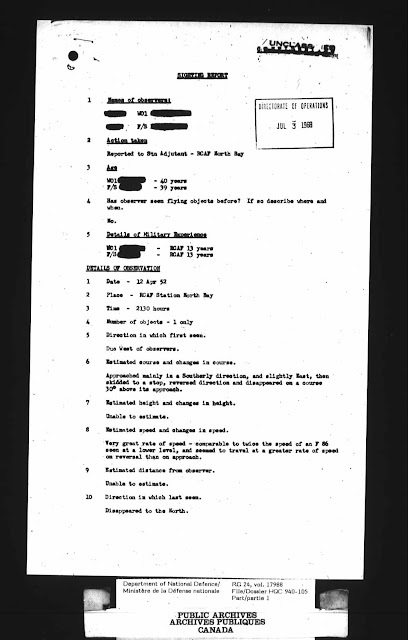 The UFO had red and green bright flashing lights about 30-40 ft apart with a steady white light in between and somewhat to the rear, thus suggesting a delta or swept-wing aircraft about the size of a B-57 bomber (~100 ft), described as “relatively high performance,” speed in excess of Mach 0.8 (530 mph), altitude above 53,000 ft, with a “considerable acceleration capability.” The UFO was lost by the F-89J at 8:42 p.m. when it climbed beyond reach of the pursuing F-89J at 49°50’N [50°20’N ? ], 113°00’W. B-52 EWO Lt. Millard regained a UFO radar signal at 8:36 p.m. for 5 mins but at 9130 MHz; noted pulse repetition frequency (PRF) of 2,500 Hz [indicative of radar set to range of 37 mi]. Nothing special. 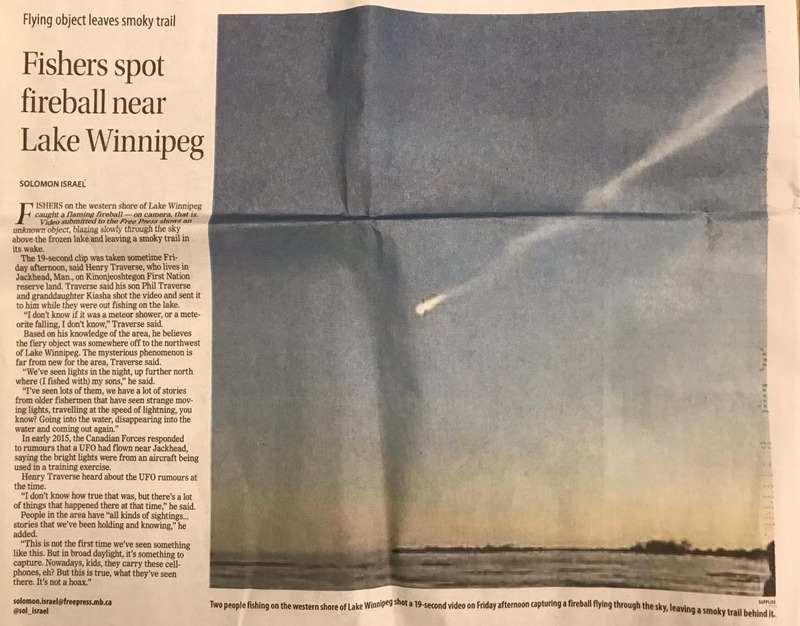 Just a UFO seen visually and on several radars during a military exercise where live nuclear bombs were in the air over Saskatchewan. I would estimate that about two thousand cases in Project Blue Book files were from Canada. 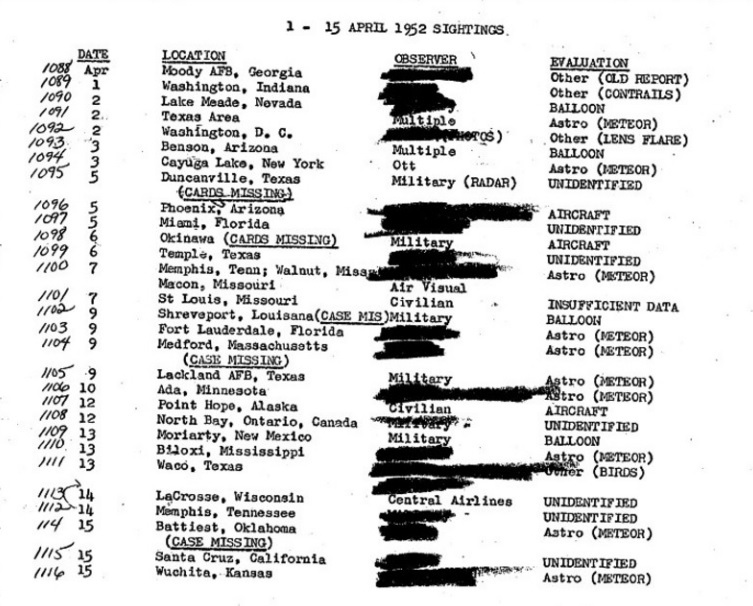 Towards the end of BB, even the noted Falcon Lake UFO encounter of 1967 was investigated as part of the USAF-sponsored Condon Committee study of UFOs and was definitely part of the Blue Book documentation of worldwide reports. 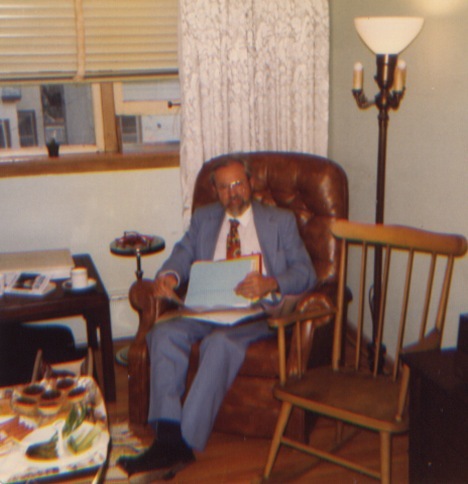 He once stayed at my home when he visited Winnipeg, and we had many long talks about UFOs and the nature of ufology. And in 1979, Allen and Mimi and their kids came to Canada for the solar eclipse. 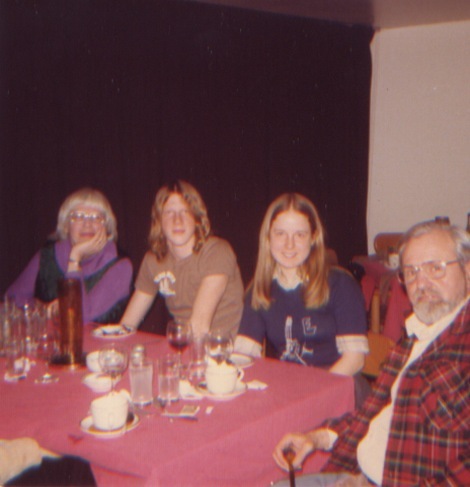 Including their son Paul Hynek, seen in this photo from 1979 with his parents and sister, having dinner with us at Hecla Island.